Based on one of the most successful studio mics released by AKG, the C 414 model, and using all the feedback that during 30 years they have received from its users (maybe they could release a new version earlier, but…), AKG has released the C 214 Condenser Recording Mic, that includes some of the features of the models which is based on and some improvements that does not make it a expensive mic affordable only for big studios. The AKG C 214 Recording Mic is a single capsule model that features cardioid polar pattern, 20 Hz to 20 kHz frequency response, from 12 to 52V phantom power, 1” edge-terminated large diaphragm, ultra low noise circuit (that includes a suspension to reduce the mechanical noise), rugged double mesh grill (to protect it from high radio-frequency signals), switchable bass cut filter, switchable pre-attenuation pad (up to -20 dB) and 3-pin XLR output. This mic is specially good for vocals and miking instruments or amps, both in stage and studio, and comes with a shock mount and a carrying case. 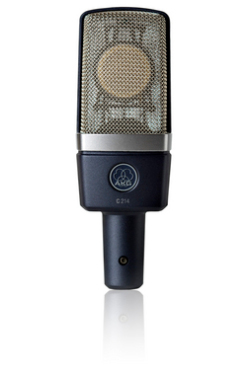 The AKG C 214 Recording Mic will be available after the AES show and its price will be $600. I have two C414s (a ULS and an EB…..don’t ask why I need two, I just DO….or think I do). Honestly, I can’t think of the last time when I put them OUT of cardioid pattern. “This is to let you know about the Memorial Tribute concert to celebrate the life of the late composer/pianist Bob Florence. WHEN: Sunday, June 15 (Fathers’ Day), 2008, 1 PM to 5 PM. WHO: The Bob Florence Limited Edition big band, playing compositions and arrangements by Bob Florence; the Phil Norman Tentet playing music by Bob; a multi-media event about Bob’s life by his daughter Melanie, and various speakers. There seems to be a lot of these “lists” that magazines/newspapers/your mom are doing right now. Anyhow, the New Yorker published it’s “100 Essential Jazz Albums“. I think it is kind of bogus. No Herbie Hancock? At all? Nada? Eric Dolphy is in there twice, and Josh Redman is in there, but not Herbie?